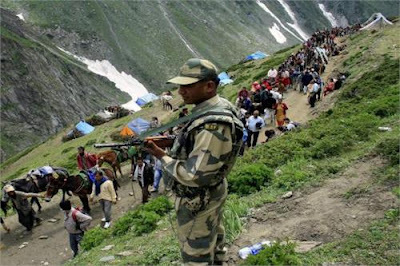 More than 12700 yatris have registered for the first day yatra to the pilgrimage to holy cave shrine of Amarnath. This excludes the traveller using the heliservices up to Panjtarni. Traveller using heliservices is between 1200 - 1500. A valid health certificate has been made compulsory for the yatris going for the darshan of the pilgrimage. The pilgrims can only be between age of 13 years to 75 years. It is also estimated that 6567 pilgrims have registered to travel by the baltal route while 6150 yatras preferred the Pahalgam route.